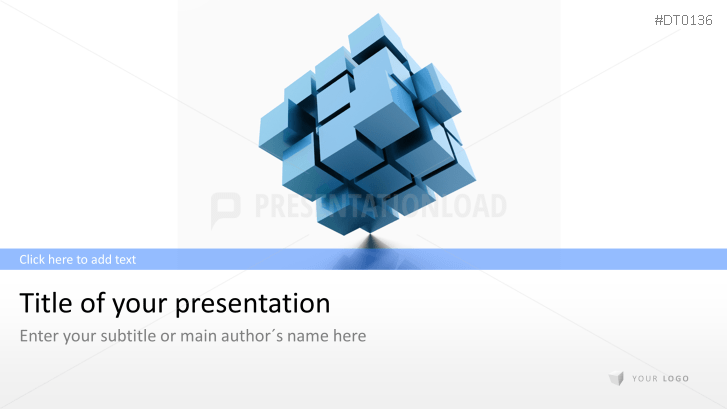 Use the 3D Cube 1 PowerPoint templates for your professional business presentation. Based on the design of a Rubik's cube, the 3D Cube 1 templates offer a way for your business to shed light on all sides and thus be able to create a comprehensive business presentation. In order to run a business properly, it is necessary to have successful coordination in all sectors. The templates allow you to highlight the company’s aspects that are of concern by using various tools, such as charts and tables. Benefit from the design tools provided in this PowerPoint set (line, pie, bar graph, etc.) and clarify the structure, the development and the goals of your company to your audience. With the presentation, you can list both volumes and sales, compare the profits of various business sectors and show developments, as well as present your customers and their testimonials. For this, you have slides with the customer logo and placeholders for customer comments. In addition, you can link your business presentation to your company’s social networking sites by using the included social media icons. Furthermore, these icons provide you with a table toolbox containing a collection of basic icons to further your design possibilities.